Tokyo has the image of a bustling and super-modern metropolis, but Western Tokyo is very different from the 23 wards that make up central Tokyo. Green and rich in nature, fresh vegetables are grown in the fields and sold by the side of the road, often in unmanned stalls where payment is on trust. A favourite (dog) walking and jogging route is along the Tamagawa Jōsui or Aqueduct (玉川上水）. 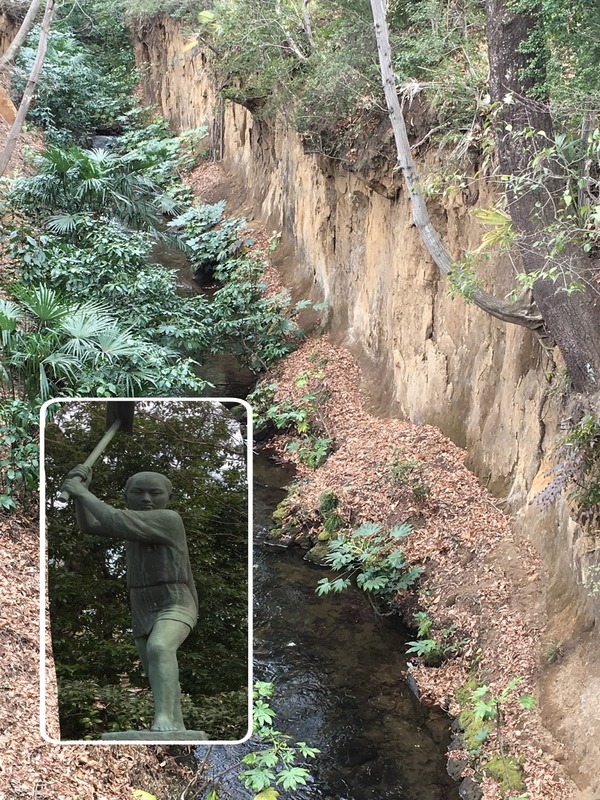 In response to Edo's - the old name for Tokyo - need for water for drinking and fire-fighting, in 1652 the Shogun commissioned the building of an Aqueduct to bring water from the Tamagawa River right into central Tokyo, a distance of 43km. Despite the basic tools of the day - the inset shows a worker armed with a traditional kuwa or tsuruhashi (hoe or pickaxe) - the work was completed in record time. Today it is possible to walk from Hamura in the West to Yotsuya、East of Shinjuku (though 13km is underground). The picture shows how the sheer rock was excavated and cut deep down, revealing startling tree root formations. Koi carp and turtles are common in the Aqueduct and herons (aosagi） often fly in to fish. Friction between local citizens who want to preserve the environment and Tokyo politicians looking to build infrastructure came to a head in 2013 when Tokyo's first ever local referendum was held in Kodaira on whether to build a road which would dissect the Aqueduct. For more details see my paper here. For more information on the Aqueduct in general, including a detailed history and walking maps, see the Tokyo Waterworks site here (in Japanese).